Consumer-driven IT is forcing an industrialization of IT to ensure it is meeting business and customer expectations in an efficient and responsible way. CIOs are increasingly looking to manage demands and maximize the value of their investments and resources. 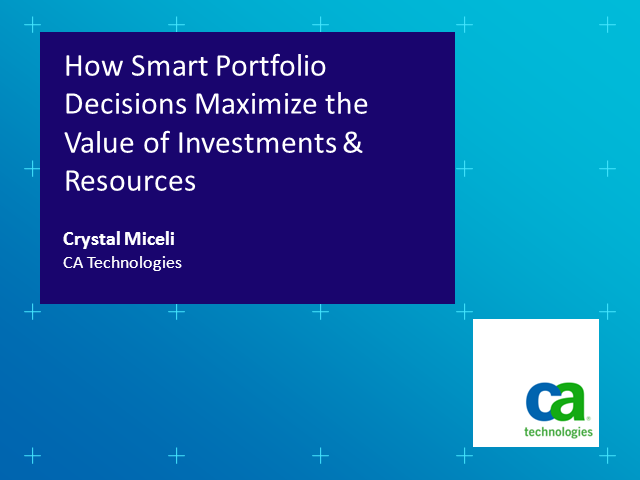 Areas like portfolio management, financial management and relationship management will help businesses make smart portfolio decisions, increase cost transparency, and communicate value in terms the business can easily understand. Join this webcast to learn how you can collect all requests for supporting existing services, provisioning new services and projects while making informed decisions regarding how to invest and best optimize the service and product portfolios based on costs, risks, business value and compliance.